Orders – issued- Further Instructions- Regarding. 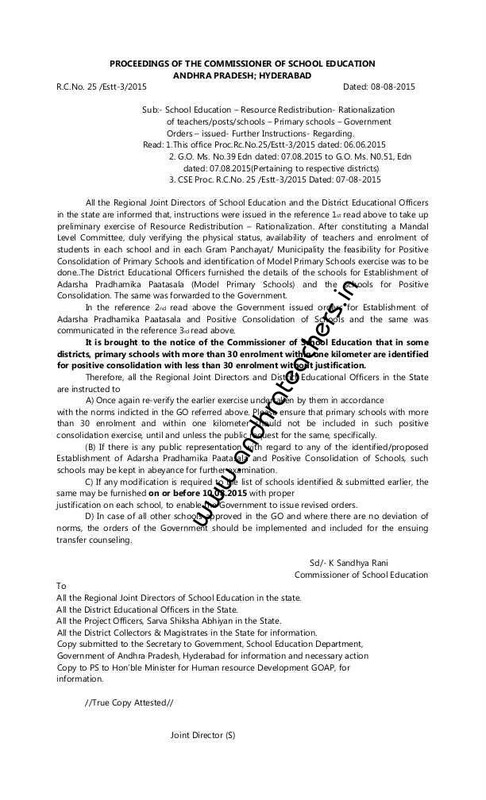 All the Regional Joint Directors of School Education and the District Educational Officers in the state are informed that, instructions were issued in the reference 1st read above to take up preliminary exercise of Resource Redistribution – Rationalization. After constituting a Mandal Level Committee, duly verifying the physical status, availability of teachers and enrolment of students in each school and in each Gram Panchayat/ Municipality the feasibility for Positive Consolidation of Primary Schools and identification of Model Primary Schools exercise was to be done..The District Educational Officers furnished the details of the schools for Establishment of Adarsha Pradhamika Paatasala (Model Primary Schools) and the schools for Positive Consolidation. The same was forwarded to the Government. In the reference 2nd read above the Government issued orders for Establishment of Adarsha Pradhamika Paatasala and Positive Consolidation of Schools and the same was communicated in the reference 3rd read above. It is brought to the notice of the Commissioner of School Education that in some districts, primary schools with more than 30 enrolment within one kilometer are identified for positive consolidation with less than 30 enrolment without justification. with the norms indicted in the GO referred above. Please ensure that primary schools with more than 30 enrolment and within one kilometer should not be included in such positive consolidation exercise, until and unless the public request for the same, specifically. (B) If there is any public representation with regard to any of the identified/proposed Establishment of Adarsha Pradhamika Paatasala and Positive Consolidation of Schools, such schools may be kept in abeyance for further examination. justification on each school, to enable the Government to issue revised orders. D) In case of all other schools approved in the GO and where there are no deviation of norms, the orders of the Government should be implemented and included for the ensuing transfer counseling. All the Regional Joint Directors of School Education in the state. All the Project Officers, Sarva Shiksha Abhiyan in the State. All the District Collectors & Magistrates in the State for information.